Today Microsoft introduced their new Miracast-based wireless streaming device for HDMI monitors and televisions. 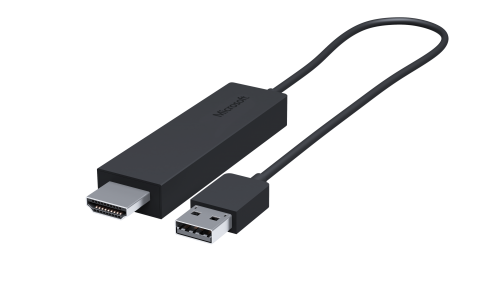 Its lengthy name is the Microsoft Wireless Display Adapter and it's Microsoft's take on an HDMI streaming dongle. One of the most popular devices in this category is Google's Chromecast, and there are many similarities between the two devices. Like the Chromecast, the Microsoft Wireless Display Adapter is a small adapter that plugs into an HDMI port on your television and uses a USB port for power. From the photos Microsoft has provided, the USB connector seems to be wired directly into the adapter which could pose a problem depending on your television's arrangement of ports as the cord does not look very lengthy. The adapter allows streaming and display mirroring from any device with support for Miracast screencasting. Because of this, the adapter is able to work with a variety of devices running on different operating systems, rather than being a device limited to devices that run Windows or Windows Phone 8. At $59.95 USD, the Microsoft Wireless Display Adapter is around $25 more expensive than Google's Chromecast. It is available for pre-order now on Microsoft's online store, and it will ship in October 2014.